Welcome to Fort Whetstone – a militant city built atop the mountains of Karstad County and one of the three major cities of Nuanor. 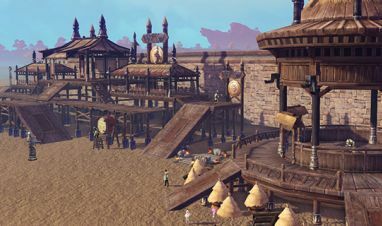 Favored by military personnel, including those of the Imperial Court and Guardian Order, it is safe to regard Fort Whetstone as a warring city – one where many factions of a fighting persuasion gather, making it a perfect place for adventurers looking to get in on the action. Be cautious, however, for not everything here in Fort Whetstone is as it first seems. During the typical day-to-day, imperial soldiers and ballistic weapons stand ready to fend off assaults from the Northern Wolf Tribe invaders, and rumors indicate that members of the Guardian Order in Fort Whetstone are conducting horrific and inhumane research on humans and animals, which is completely unexpected for such a renowned faction. Are the rumors true? If so, what possessed them to initiate such experiments? And why are the Northern Wolf Tribe so eager to rain ruin down upon Fort Whetstone? It is up to you to uncover the truths or ignore them as fanciful tall tales. As expected of any reputable military base, Fort Whetstone comes with its own War Council Room. This is where the royal court plans attacks against the Northern Wolf Tribe, though whispers from the locals indicate that it contains ancient text that could impact the very fate of Nuanor. Could this be the idle fear mongering of non-militant civilians or is there some unknown plot in motion? No matter what you think of it all, Fort Whetstone also comes with its own Storyteller Society Shop. This is a place where you can trade your Story Points (gained over the course of the game by watching cut-scenes and story-based animations). It also sells fashionable head accessories for those who have been attentive enough to watch through all in-game cut-scenes. Assuming you are not just visiting Fort Whetstone as a tourist, you could opt to win favor within the city by undertaking Grand Bulwark dungeons & raids, toppling their respective bosses or even using special items that drop inside. If you achieve enough favor, you’ll become eligible for Fort Whetstone’s best wares and special cosmetics. Sound good to you? Then pay it a visit! Regardless of the rumors, Fort Whetstone has a lot to offer passing adventurers. 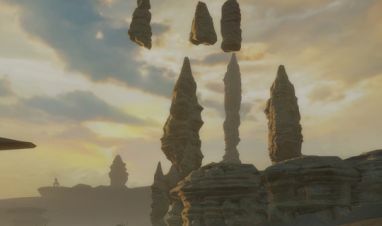 Come to this famous place in central Nuanor, just north of Eltmere Ravine, to witness one of the finest military outposts and earn Sidus Ur faction points!